In just a few months time we shall be embarking on a trip that, although may seem a bit ‘off the beaten track’ today, is actually one of the most ancient and well trodden routes of the world. The Silk Road, or pedantically speaking – The Silk Roads (as there are actually dozens of different routes) – is the journey the silk took overland from China, through the ‘stans of Central Asia and into the western world, hundreds of years ago. People spent their entire lives traversing across barren deserts in the scorching heat, warming up their icy, cold fingers in snowy mountains and stopping off at little caravanserais (aka traveller inns) for a shot of belly-warming vodka, before moving onto the bazaars to shift their goods. Actually I’m not sure the vodka bit is true at all, but there sure seems to be a lot of the hard stuff on the road now, and Matty has his eye firmly on the brandy kiosks of Kyrgyzstan that seem to be almost giving the stuff away at about 20p a shot. 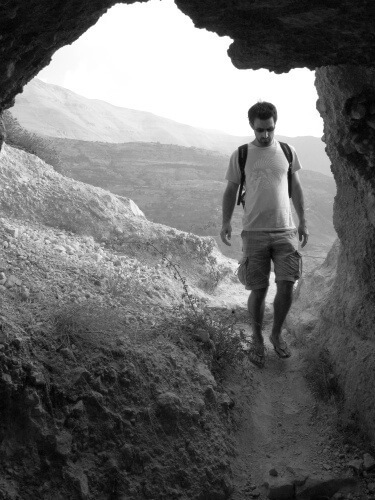 The Mongoose enters a cave in Lebanon… I have some much more entertaining photos of him, but I shall break you in gently. So, it will be me, Matty and the Mongoose taking on the Silk Road. We shall be travelling from Hyson Green (our much loved inner city streets of Nottingham) to Ho Chi Minh City in Vietnam, where we shall be working for about a year or so, if all goes to plan. From Hyson Green we shall be taking the tram to Nottingham Station, and the train to London, before embarking on the Eurostar to Paris for a swift lump of cheese and bottle of wine. From there we will take the night train to Munich, before stopping off at Salzburg in Austria, Budapest in Hungary and Bucharest in Romania, on our way to Turkey. Georgia – For its green valleys, mountain scenery and other such beautiful things. Armenia – For the Cognac (and a ‘riot of flowers’ according to the Lonely Planet). Azerbaijan – To understand what is ‘not Asia nor Europe’ and cross the mythical-sounding Caspian Sea. Turkmenistan – For fabulous gold statues, ever-burning gas craters and bugged hotel rooms. Uzbekistan – For majestic cities, brawling bazaars, ancient desert fortresses and a shrinking sea (fact). Afghanistan – For the scary armoured vehicle ride to Mazari Sharif (the Mongoose’s current place of residence). Kyrgyzstan – For horse treks, hunting with eagles and crying ‘wow’ a lot at stunning scenery. Tajikistan – For the world’s most remote mountain-top road trip (the Pamir Highway) and hospitable home stays. Kazakstan – For the leafy city of Almaty that sounds too much like ‘Oh Matty!’ to risk missing. China – For the ‘Desert of Death’ aka ‘The Point of No Return’ or the name it goes by on most maps – the Taklamakan Desert. We don’t talk about this. And of course Xi’an where the Silk Road ends. So there we go, that’s our journey. The journey taken by hundreds of camels years ago, as they travelled nose to tail, pulling large, heavy caravans through swathes of deep, dry desert sand for miles and miles. Am I scared? No, not at all. * Bring it on. Follow our journey on this blog. I may do some geeky posts about gear and what to pack before we set off but you can ignore those and join me for the ride from April 22nd if you fancy it. *I might be a bit scared… Crossing the desert of death in 40+ degrees does sound a little scary, right? 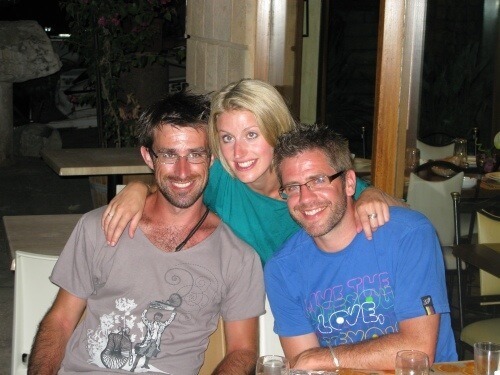 This entry was posted in Recent Posts, Travel and tagged The Silk Road, Travel plans by Delia. Bookmark the permalink. It sounds wonderful! Gordie and I both wish you a wonderful journey. Can’t wait to read your posts. What an incredible trip it sounds….good luck, and I’ll definitely be following your journey. Dlightly more gruelling than our trip to the Gambia! I think that lusting after trips like this (and following yours of course) is how I shall beat the January blues. hi,, i did the silkroad trip(in China part) yrs before from Beijing to Karshigar,,and its was amazing trip ever i had befo….strong suggest tht you should do the Desert of Death,, i went into the desert and found there is a great lake in the center of desert and some vigur tribes islatolated there,,due to the time constrains i didnt go to the north of Xinjiang ATR,,so if possible i may join you to see The Point of No Return’ and then go to the north xinjiang…. Wow… That sounds incredible, tribes and a lake, good discoveries! Did you cross it by bus? I’ve seen there’s some kind of highway through it?! Good luck Delia – I will miss your inquisitive nature, enquiring mind, probing questions and very good editiorial in the Post. Thanks Nicky! And thanks for always answering my endless questions and meeting my demanding deadlines! There’s lots to miss but looking forward to some new challenges – ill keep this blog updated! I’m writing from Turkmenistan! I’m an American working at the international school here. Grace Liu, a fellow traveler who was here a few weeks ago, turned me on to your blog. If you want to hang out with some expats, my husband and I would love to show you some of our favorite Ashgabat spots while you are in the area. We’ve lived and worked here for five years and we are quite happy living here. In addition to offering tour guide services (we can stop for cold beers whenever you want), could I possibly convince you to give a career presentation at our school? Several of our secondary students are interested in journalism and would love to have the chance to talk with you about your career. Hi Debbie, wow – that sounds like something a little bit different to do in Turkmenistan!! But yes, it would be lovely to meet you both and perhaps I’m sure I could prepare something for the students! We hope to get to Turkmenistan in June 7th but I’m not sure how long we have in Ashgabat. Do you want to email me at deliajayne@hotmail.com and We’ll see what we can work out! We heard that you are travelling in Land Rovers? Must be good advertising! Ps is anyone doing a movie for you tube or BBC for the future? Hi, we need your suggestion. Do you think it’s safe to travel with our 1,5yo baby to Kashgar, Turpan and Dunhuang (China) in May?